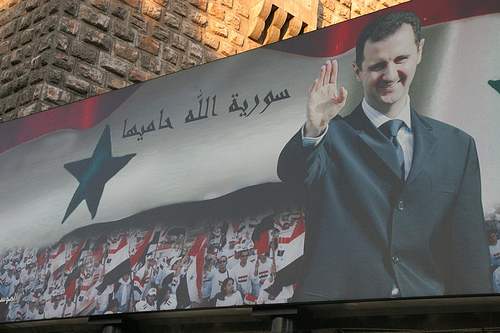 [Photo of Syrian Leader Bashar al Asad, courtesy of Flickr poster madmonk, Creative Commons License). Back in January I linked to a review of a book called The Truth About Syria by author Barry Rubin (review was written by Lee Harris). Prof. Rubin noticed that post, contacted me, and graciously offered to send me a copy of the book. It arrived about 2 weeks ago and I just finished reading it. This review is only going to deal at the level of ideas, policies in the book. For background, here is an interview with Prof. Rubin outlining the basic thesis of the book. I should also say that readers of my blog will know that my views don’t line up totally with Rubin’s. That being said, I highly recommend the book. Agree or disagree with his conclusions, it gives an insight into the mindset of the Syrian regime that penetrates through the fog of disinformation often out there on the subject. The central achievement of the book in my mind (along the lines of what Lee Harris said) is that Rubin understands that the activities of the Syrian regime are rational from the perspective of a clan-based dictatorship that seeks its own survival. It is instructive in this regard I think to compare Rubin’s work (and its subject Syria) with John Bradley’s recent excellent book Inside Egypt. The takeaway from each is that both countries are mired in economic stagnation, omnipresent corruption & political repression. In Egypt this has translated into a near total de-legitimization of the regime. For Bradley, contemporary Egypt resembles most closely Iran in the final days of the Shah, i.e. it’s poised for a potential revolution. The Syrian regime however as Rubin demonstrates (though all of the same factors are in play) is gaining strength and legitimacy domestically. How can this be? The answer lies for Rubin in the fact that Syria unlike Egypt did not take a deal with Israel and America. It has positioned itself as the oppositional force of Arab (and increasingly Islamist) resistance against the hated West. Therefore, according to Rubin, it is in Syria’s rational interest (from the perspective of regime maintenance) to continue to play its long running game of cat and mouse with the West, appearing on the one hand rational and open to dialog and compromise and on the other obfuscating and shuttling any such deals. Plus exporting terrorism and de-stabilization abroad. Because if Syria struck a deal with Israel and the US (the Golan Heights for recognition of Israel) overnight it would become Egypt. If it opens its economy the regime will fall. If it dispenses with its irredentism it will fall. As proof of this argument, the Mubarak regime in Egypt is increasingly using anti-Shia rhetoric which borders on racism (i.e. Shia Arabs are not really Arabs, they are Persian 5th Column) in order in a sense to revive a Syrian-style opposition and garner support for the regime. It however seems not be working and is pretty transparently fraudulent. With Syria on the other hand, it’s legit in a number of ways (esp. support of Hezbollah). Now I have to say that’s a depressing conclusion, but try as I might hard to disagree with it. Relative to Israel that is. My principal disagreement with the book however is the larger frame of Syria as part of an Iranian Syrian-Hezbollah-Hamas axis versus the so-called moderate Arab regimes, e.g. Egypt and Saudi Arabia. The moderate Arab regimes are dictatorships as well so I don’t see them as in any way moderate. Relative to Iraq, Syria has managed to keep relations (often friendly) with all sides. As a country of mixed Shia, Sunni, (Christians) and Kurds, the Syrian regime has connections with the Sunni insurgency, the Kurdish regional government even though Syria has its own fears of Kurdish separatism (and therefore can act as a go-between for Turkey/Kurdistan), the Shia government and even the Sadrist movement, not to mention Sunni and some Christian refugees from Iraq. Syria and Iran’s games in Iraq overlap in some measure (fomenting anti-Americanism) and in others don’t (Syria is much closer to the Sunni populations than is Iran which is the hated enemy of the Iraqi Sunni. I think on Iraq Iran and Syria are going to have be dealt with like it or not. The installed regime in Iraq consists of a great many former exile who spent years in Syria and/or Iran. (e.g. Dawa party of PM Maliki). They are going to have the kind of influence and relations with these countries that the US does not want them to have and nothing is going to alter that particular reality. Syria is positioning itself to act as a mediator between say Saudi Arabia/Jordan and the Iraqi government. Whether that difference could actually be exploited in the policy realm by the West is an entirely different question. But as the US withdraws from Iraq, Syria is going to have increased stature (already does but itwill only increase) and a regime clearly more friendly to it than the hated Hussein. In some fashion or another that is going to have to be dealt with and yet to Syria’s West–support of Hamas in Palestine, Hezbollah in Lebanon, resistance against Israel–the basic dynamic Rubin lays out remains it would seem unchanged. Washington Post correctly says that John McCain is “distorting history” as he criticized Barack Obama’s pro-negotiations position. The United States really only has two experiences with a sustained effort at the Bush/McCain approach to diplomacy. One would be our effort to deny recognition to Communist China during the Truman, Eisenhower, Kennedy, and Johnson administrations. This, it’s generally acknowledged, was a strategic fiasco that denied us the opportunity to gain leverage vis-à-vis the Soviet Union. Indeed, it was a fiasco of such enormous proportions that Richard Nixon’s role in undoing it actually manages to stack up in a non-trivial way against his otherwise terrible record in office. The other is our fifty year effort to starve the people of Cuba into rebelling against Fidel Castro. McCain actually defends continuing this policy, but everyone with a functioning brain understands that it’s been a ludicrous failure. So that’s the path Bush has been taking with Syria and Iran and used to take with North Korea. McCain wants to keep on taking it, put North Korea back under the interdict, and perhaps add Russia to the disfavored list. Like McCain’s apparent belief that it would be better if we’d spent another decade or two fighting in Vietnam, it really calls into question whether he has any understanding of what he’s talking about. Meanwhile, the Military Intelligence and the Mossad share the view that Syria is prepared to sever its ties with extremist groups in the Middle East. Both estimate that Syria would be more likely to embark on such a scenario if Israel were to agreed to return the Golan Heights and if U.S. were to renew negotiations with Damascus. What was that about never negotiating with evil evil people? And which candidate got crapola from (as I recall) both within and without his party for be willing to increase American diplomatic strength? Harris has a number of pieces (of varying quality imo) at Policy Review, from the Hoover Institution. You can hear the same themes recurring, mentioned in the Hirshi Ali piece. His latest, a review of Barry Rubin’s The Truth About Syria, is one of the better ones (except for the vague reference to the Saddam’s WMD program might be in Syria conspiracy theory). Rubin’s book also, by this review, sounds worth the read. What makes The Truth about Syria invaluable is Rubin’s insider’s perspective on the Syrian regime: He is able to grasp Syria from the Syrian point of view, and to see our side from their side. This is not to say he is an admirer of the regime; on the contrary — he looks upon Syria as one of a “new breed of dictatorships” that “jeopardize the hope for a better future not only for the West but also for those unfortunate enough to live under their rule.” But Rubin is able to put himself inside the minds of those who have led the Syrian regime for the past three decades. Like a novelist, he knows how to bring his characters to life, to see the world as they see it, and feel it as they feel it. There are no cardboard villains in his book; cardboard villains can teach us nothing about the true nature of evil — only living characters can. Rubin brings Syria to life for us, and in so doing makes it absolutely clear why there can be no hope for reform of the Syrian regime and why no trust can be placed in it by the West. The game they are playing and have played is to on the one hand use the threat of Islamist takeover to continue the militarization and dictatorship of Syria while on the other using Islamists (e.g. in Iraq, Hamas) to propel their influence way beyond it’s otherwise expected level in the region. Other highlights (or lowlights depending on pov): no way for regime change. But other forces at work–demography for one–that could shake the system down the line. Readers familiar with John Robb’s Global Guerrillas will find strong echoes of his thinkin at the end of the piece (on asymmetric warfare). Did Israel Strike a Syrian Nuclear Reactor? So argues David Sanger in the NyTimes based on Israeli and US analysts (worth keeping in mind how off those traditional intelligence tools have been of late, plus the possibility of psych ops).